Since its beginnings in 1958, GNLD has been committed to product excellence and innovation. Over the years, this “GNLD Difference” has resulted in the creation of hundreds of leading-edge products. The following list of GNLD technical achievements and industry firsts is by no means comprehensive; it is meant to convey only the major milestones by which we measure the sure and steady progress that has made GNLD a trusted and respected name worldwide. Natural Formulas, GNLD’s brand new research and quality control laboratory and manufacturing plant, is built. Dr. Kenneth Hirsch joins the Scientific Advisory Board. Salmon Oil Omega-3 fatty acids establish a new benchmark for product purity. Dr. Fred Hooper, Mr. John Miller, Dr. Lazlo Somogyi, and Dr. Gordon Newell join as scientific advisors. Acidophilus Complex features Targeted Delivery Technology for two-piece hard-gel capsules, a whole new concept in acidophilus supplementation. 1987 Texas A&M studies show Tre-en-en Grain Concentrates support growth, development, and efficient nutrient utilization. Computer link is established between GNLD and the National Library of Medicine. Herbal Alternatives provide a 5X concentration of herbs from traditional Chinese formulations. Demonstrating its continued superiority, Water Dome (undercounter and countertop) is selected “Best Buy” by Consumer Digest. Carotenoid Complex is the first and only supplement to provide the full carotenoid profile of an optimal serving of fruits and vegetables. GNLD becomes the only direct selling company ever invited to present its findings (a Carotenoid Complex study) to the New York Academy of Sciences. Dr. Arianna Carughi and Dr. David Shepherd join the Scientific Advisory Board. 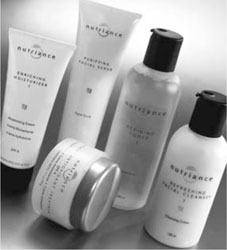 Nutriance’s Vitamin E Therapy provides clinical intensity skin care. Vita-Guard brings chewable antioxidant vitamins, minerals, and phytonutrients to children. Naturally flavoured and sweetened. Carotenoid Complex studies conducted by U.S. Department of Agriculture and university scientists are published in the American Journal of Clinical Nutrition and other journals showing that Carotenoid Complex can boost blood carotenoid levels and the body’s defence system and protect LDL cholesterol and cellular lipids from oxidation. Flavonoid Complex, the first whole-food flavonoid supplement, offers leading-edge, water-soluble, antioxidant protection from fruits, vegetables and green tea. Cruciferous Plus provides phytonutrients from cruciferous vegetables and other whole foods. Studies conducted at an independent scientific laboratory using stringent National Cancer Institute protocols show that Flavonoid Complex and Cruciferous Plus can inhibit the growth of unwanted and destructive human cells in test tubes. “Gel-Gard” Enteric Protection System results in the highest potency supplement of beneficial microflora, Acidophilus Plus. Nutriance breakthrough skin care technology (with ACR, Vitamins E, C, A, green tea and echinacea), is proven to reduce fine lines and wrinkles by up to 28% in just 28 days. Human clinical studies prove Nutriance Renewing Antioxidant Treatment boosts antioxidant activity by 90%, protecting skin against free radicals and UV damages. SAB and Global Science Network (GSN) experts introduce cutting-edge GR2 Control weight loss programme proven to help the body achieve and maintain a healthy weight, helping to reduce the risk of diabetes, heart disease, and osteoarthritis. GR2 Control is clinically tested and proven to deliver the power of Glyceamic Response Control, which maximises fat burning, minimizes fat storage, and re-educates the body toward lifelong healthier eating habits. 8x the antioxidant power of the original formula! The new Carotenoid Complex uses entirely lipid-extracted carotenoid concentrates in a base of pure olive oil for maximum benefit. One Carotenoid Complex capsule provides the antioxidant power of 800 IU of vitamin E or 400 mg of vitamin C!